Slaying giants: Erin Huck has repeatedly beaten the top women racers in North America. Behind her at Fontana this year were soon-to-be 2018 world champion Kate Courtney (1) and two-time world champion Catharine Pendrel (7). Erin Huck’s win of the Pro Women’s Cross-Country class at the 2016 National Mountain Bike Championships came as a surprise to many people in the sport. It was Erin’s first time winning a national title—and she was 35. Most top cross-country racers are nearing the end of their careers by that benchmark, but Erin had just arrived. Furthermore, Huck didn’t win just one national title that weekend; she won two. She won both the pro women’s short-track and cross-country national titles. In her cross-country race, Erin beat one of the best female cross-country racers in American history, Georgia Gould, who took the runner-up spot more than 41 seconds behind Erin in their cross-country battle. In 2017 Erin won her third national title, taking the Pro Women’s class in the short- track event. This year Erin proved yet again that she’s still a formidable competitor. In April she started off the 2018 racing season by winning both the cross-country and short-track events at the first two major American races of the year—Bonelli Park and Fontana, both in California—against an all-star lineup of top female racers. In July Erin racked up yet another USA Cycling National Championship title, this time in the Pro Women’s Short-Track class. Erin’s racing success is that she wins events at this level while holding down a full-time job in a high-level position at a medical device company where she works as a project manager. Her degree from the University of Colorado in mechanical engi- neering has served her well. Erin competes in major races, then flies back home to Colorado to go back to work. Most people have enough of a challenge pursuing one career successfully; Erin handles two. How long will Erin be a major factor in cross-country racing? That is hard to say. Two of the sport’s top women are still winning major races in their 40s. 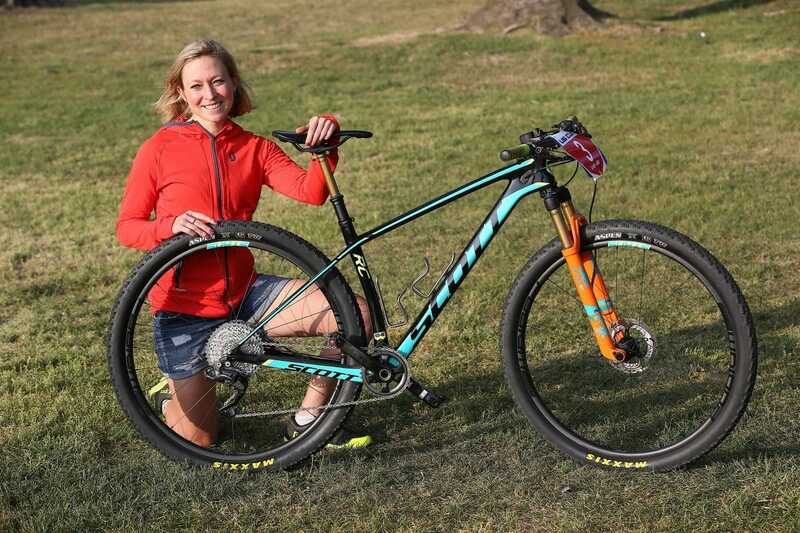 Gunn- Rita Dahle Flesjaa, 45, won the Vallnord, Andorra, World Cup race this year, and Sabine Spitz, 46, took second among the elite women in the 2018 Absa Cape Epic. It’s hard to say what the peak age for women racers might be, but it’s entirely possible Erin Huck may still be getting faster. Started racing: Racing at the elite level in 2012ish. I was a recreational bike racer, runner, etc. Favorite course (North America): It changes every year! 1. Frame: Scott Contessa Scale RC 900, size medium, carbon. 2. Fork: Fox Factory Step-Cast 32 with a 44mm offset and 110mm Boost thru-axle. The fork has the Fit4 three-position damper that integrates with the Scott-specific Twinloc remote lockout. Erin ran 51 psi in her fork with one volume spacer. 3. Tires: Maxxis Aspen 29×2.25″, 120 tpi, tubeless-ready, with EXO casing at 19/20 psi front/rear. 4. Inner tubes or sealant: Stan’s NoTubes Race sealant. 5. Rims: Stan’s NoTubes Podium SRD 29er wheelset. 6. Spokes: Sapim Custom Laser; ultra-lightweight, durable, maximum-shock-absorbing, 1.8/1.5/1.8mm, triple-butted spokes. 7. Front hub: Stan’s Neo Ultimate, Boost 110mm. 8. Rear hub: Stan’s Neo Ultimate, Boost 148mm. 9. Brakes: Shimano XTR Race calipers and brake levers with 160mm IceTech Centerlock rotors. 10. Handlebars: Shimano Pro Tharsis XC carbon, 710mm width, 5-degree rise and 9-degree sweep. 11. Bottom bracket: Shimano XTR. 12. Grips: Lizard Skins DSP 30.3mm in green. 13. Cranks: Shimano XTR Trail with 170mm crankarms and Stages XTR power meter. 14. Chainring(s): Shimano XTR 34T 1x-specific ring. 16. Pedals: Time Atac Carbon 12 with titanium spindles. 17. Rear derailleur: Shimano XTR Di2. 18. Front derailleur or chainguide: Scott chainguide. 19. Shifters: Shimano XTR Di2, 1x shifter set up on the right side of bar. 20. Brake levers: Shimano XTR. 21. Rear cassette: Shimano XT 11-42. 22. Saddle: Fabric Scoop Pro Flat, 142mm width. 24. Cables and housings: Shimano E-Tube wiring harness and Shimano hydraulic brake hose. 25. Headset: Scott stock headset. 26. Water bottle cage: King Cage titanium. 27. Stem: Syncros XR1.5, 70mm, -8 degrees. 28. Special touches: Custom name stickers, fork decals and wheel decals made by VC Graphix. Bike cleaned and lubed with WD40 Bike products. 29. Extras: Stages Dash head unit, mounted landscape view. 30. Head angle: 69.5 degrees. 31. Bottom bracket height: 312mm. Erin: I grew up in Estes Park, Colorado. MBA: What kind of work do (or did) your parents do? Erin: My parents were teachers, now retired. Erin: Hmm, not sure. I was a young kid and used my bike to go visit friends and get into trouble! MBA: When did you first start competing on a bike, and what kind of bike was it? Erin: I tried a few triathlons in college, and I borrowed a friend’s road bike to do it. MBA: Did you race BMX or road bikes before competing on mountain bikes? Erin: I did some road racing as part of the CU cycling team. Erin: I am a four-time U.S. national champion, 2017 continental champion. I was XC and STXC national champion in 2016, and STXC national champion in 2017 and 2018. Erin: I have a degree in mechanical engineering from University of Colorado, Boulder. MBA: Do you have any other career experience besides racing? Erin: I work currently! I am an engineering program manager for a medical device company. I’ve been working in this field for 12 years. MBA: What other sports do you like to do? Erin: So far I don’t have any other remarkable athletic talents, although I’ve dabbled in triathlon and running. MBA: If possible, please tell us something interesting or unusual about yourself or your family that is not widely known. Erin: I don’t think there is anything super interesting or unusual about me!